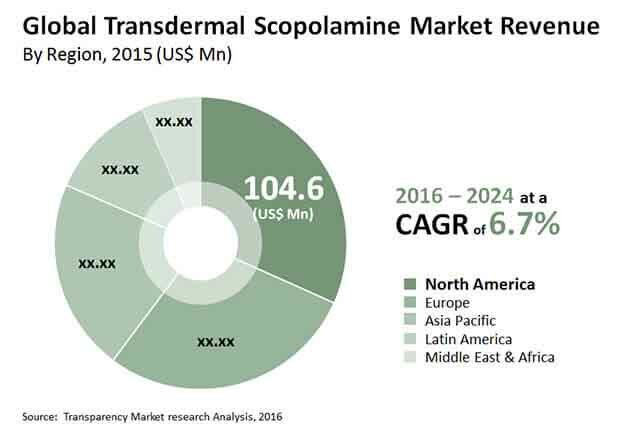 TMR observes that the global transdermal scopolamine market is experiencing the high competition and consolidation due to presence of strong players. Some of the key players operating in the global transdermal scopolamine market includes Baxter International Inc., Novartis AG, GlaxoSmithKline Plc, Caleb Pharmaceuticals Inc, Perrigo Co. Plc, and Myungmoon Pharma Co. Ltd. Among them, Novartis AG accounted for nearly 41.0% of the overall revenue in 2016 of the global transdermal scopolamine market. GlaxoSmithKline Plc and Baxter International Inc., accounted for 49.0% of shares together in the same year. The presence of small companies in the market are intensifying competition and international players are adopting the strategies like acquiring small or local companies to strengthen their presence in region and for business expansion. The global revenue of the market was registered at a value of US$330.0 mn in 2015, is projected to grow at a CAGR of 6.70% over the forecast period from 2016 to 2024 to attain the value of a US$585.3 mn by the end of 2024. Regionally, the market is dominated by North America being the well-established market for players operating in healthcare industry coupled with high expenditure capacity of people on healthcare, and penetration of transdermal scopolamine in surgeries and post-operative recovery. Increasing awareness about the effectiveness of transdermal scopolamine in the treatment of motion sickness is boosting adoption of transdermal scopolamine. This factor is likely to boost the growth of the global transdermal scopolamine market. Additionally, growing number of travels and travelers using the transdermal scopolamine as safety purposes is bolstering growth of the global transdermal scopolamine market. In addition, transdermal scopolamine are helpful in the control on hyper salivation and possess the properties of faster recovery from anesthesia, postoperative vomiting, and nausea. Owing to these advantages, the transdermal scopolamine are increasingly used in the surgeries mainly for controlling salivation and withdrawing its side effects are fueling demand for growth of the global transdermal scopolamine market. Thanks of these factors the market is witnessing substantial growth. Despite of this growth, the possible side-effects caused by the consumption of the products such as drowsiness, retarded motion, and diluted pupils are hampering growth of the global transdermal scopolamine market. Additionally, presence of stringent regulations related to manufacturing and selling these products are crimping growth of the global transdermal scopolamine market. Nevertheless, rising awareness in the developing countries are boosting demand and expected to offer lucrative growth opportunities. The higher production from the small and mid-scale companies operating in developing regions is creating growth of the global transdermal scopolamine market. In addition, improving healthcare sector globally and booming medical tourism are offering the immense potential to these companies for growth.